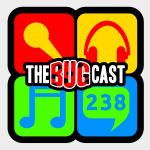 the bugcast 238 – The holidays are coming… but we’re still rocking! On this week’s show, we’re back in the studio for another live show… and probably kicked out one of our best shows in the process! A bit of chat about our November projects, a call for good vibes, and our upcoming scan… along with 8 fantastic pieces of music. Perhaps NaVlogPoMo for Dave next year? The next show will be episode 239 – broadcast live in the chatroom on Friday 30 November from 21:30 UK time.